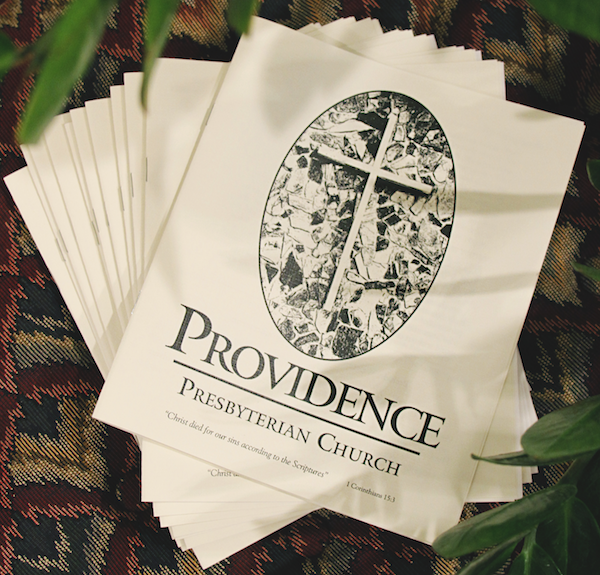 Scriptural worship on the Lord’s Day is the highest priority of Providence Presbyterian Church. Communing members and covenant families are encouraged to prepare for the service of worship each week. Additionally, the Lord’s Table is observed monthly, usually on the first Sunday. Scripture is the primary means of grace; therefore, public worship at Providence is Word oriented. Christ is the Eternal Word and the final, complete revelation of the Father (John 1; Hebrews 1). Accordingly, the use of sacred scripture informs the entire service of worship: confession is made in the words of the Bible, the Old and New Testaments are read (I Timothy 4:13; Colossians 4:16), psalms are sung, the Bible is carefully reverenced and taught, and prayers, too, are given in the language of Scripture. The collective sum of the elements which compose a service of public worship is called the liturgy. Liturgical practice reveals what the church believes about God and shapes the spiritual life of the worshiper. Consciously or unconsciously, every church expresses her worship through a chosen liturgy. The criterion for selecting which elements should appear in the liturgy is the Bible. Scripture alone should determine the elements to include in worship. Humility, reverence, awe, and joy describe the tenor and conduct of acceptable Christian worship; and preaching of the sacred Scriptures is the primary means of grace. Our hope is that all who attend will enjoy a newfound understanding of the Christian gospel and will therefore eagerly anticipate participation in worship. The 16th-century Protestant Reformers carefully evaluated both Scripture and the teachings of the early church before constructing their order(s) of worship. Providence intentionally followed their pattern in formulating the liturgy for use in our public worship service on the Lord’s Day. Click on the bulletin below for a sample of our typical liturgy.